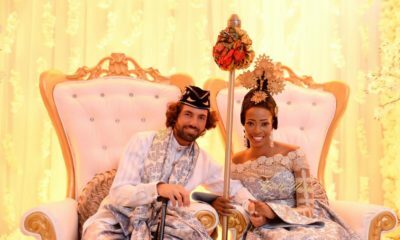 Angela Nwachukwu, 72, a British woman from Dorchester, Dorset has narrated how she met her Nigerian husband on Facebook. Angela, a retired taxi driver, got married to Owerri-based Computer Engineer CJ Nwachukwu in 2015, three months after he added her on Facebook. 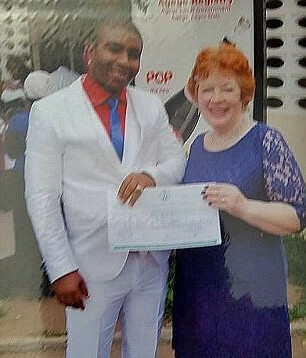 The wedding day was also the first time they met face-to-face, and although she had spent £20,000 visiting Nigeria and trying to get him a visa, his application has been rejected twice. “CJ is the most caring man any woman could want to be with. He makes me feel like the most beautiful woman in the world. I know in my heart we belong together and we won’t stop fighting until we can be together as husband and wife. We won’t let this break us,” she told The SUN. Angela, who had been single for 6 months prior to meeting CJ, had been in a 16-year relationship. “After my relationship ended, I felt lonely. We had become more like friends than partners so we had decided to split. After being single for six months, I saw a gorgeous young man had sent me a friend request on Facebook. I did wonder why he had added me but I accepted and he sent me a message telling me how lovely my profile photo was. He was so handsome, with big, brown eyes and a body to match. I didn’t see the harm in striking up a conversation with him. The only problem was he was 45 years younger and lived 4,000 miles away in Nigeria,” she said. Angela, who has sons aged 50, 47 and 43, said she couldn’t help falling for CJ. “Despite our huge age gap, we got on really well. I couldn’t help it and began to develop feelings for him. I tried to stop myself. He was six years younger than my oldest grandchild. But I couldn’t help falling for him. When I first told my son Malcolm about CJ, he was worried it might be a scam, so he checked him out online. After seeing how squeaky-clean his social media was, he felt he was genuine. They could all see how happy I was. We started chatting on Skype and I’d get butterflies when I saw his face on the computer. After a few weeks, CJ told me he had feelings for me. I was so happy,” she said. She added that he popped the question in February 2015, a month after they started chatting. “I was so taken aback when he asked me to marry him. I thought he was joking. But he told me he wanted to spend the rest of his life with me. Of course, I said yes. He was beaming at me with such a big smile on his face. Knowing I made him that happy was all the reassurance I needed. There was such an amazing chemistry between us. CJ had planned the whole day and had bought us both wedding rings. Sadly, none of my family could make it as it was such short notice. But I felt happy to have their blessings. The six-hour plane journey felt like a lifetime. I was worried CJ might not like me in person. But the moment I saw him waiting for me I knew I’d made the right decision. I gave him a hug and he kissed me. We’d originally planned to wait until the wedding night to consummate our relationship but we couldn’t keep our hands off each other. CJ was so loving and passionate,” she said. 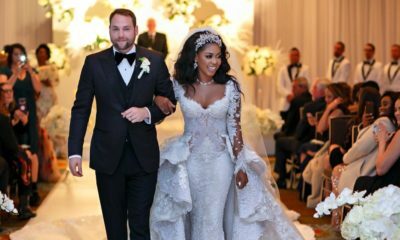 The wedding took place in April 2015, and Angela described it as the “happiest day” of her life. “The ceremony was so beautiful and CJ had organised it all perfectly. It was the happiest day of my life. I felt so lucky — but it was bittersweet because I knew I had to go back to England. The two weeks I was there flew by,” she said. Angela began the process of visa application for her husband but it has been turned down twice. The Visa was rejected because officials didn’t think we had financial backing, as I was retired. Over the following months I tried again and again to appeal the decision. It broke my heart every time it was denied. He wasn’t even allowed to visit me on a tourist visa. I’d waited so long for true love — and now I’d finally found it, it was being kept from me. I know there are scam marriages and they get hold of older people like me. But they find out if you have money first. I told CJ from the beginning I haven’t any money. But he told me, ‘It’s you I want’. I know it goes on and that’s why I was so upfront. I have helped CJ financially but he has always paid me back. Our only hope now is that CJ will be allowed to come next year on a student visa to study his Masters in computing. I’m hoping to go to Africa later this year to visit him and I’m counting down the days until I can see him again. This is ridiculous ..WTF…Happy Green card CJ Nwachukwu.. Sometimes ehhhhh, I just blame all these selfish women…. in your vulnerability,you want to waste this young man’s life. He told you he wanted to spend the rest of his life with you….even if he meant it,you went ahead knowing that it couldn’t possibly be real and right. The red flags are there yet the curse of loneliness wouldn’t let you tell this young man to walk away. Shame…it’a CJ’s loss…The old woman wins. Eeeya….. won get obirin yi. Nigerians, I keep telling all of us wanting to be like oyinbo people to learn to sieve the good aspect of their culture from the bad and copy only the good. All the women who have fallen for these yahoo scam have the same story, they were bored and lonely!!! What makes them so desperately bored, they have no family attachments. Little or no social engagements. Yes welfare is good but money and material wealth will not give you warmth and support! so let us not forget our glorious cultural family and social social network system. Despite all the govt support, they are so desperately bored they loose their minds in all manner of ways. Its terrible. Growing up we can all remember how our parents and their siblings, including their external relations were close and their life was okay. let us re-activate that family system. Yes they had their issues but we could not deny the bond between them..
All these high fence private life only allows life gets to you especially when you loose those immediate loved ones. you might want to say they were jazzed but my sister always says that jazz will only flourish if it has breathing space. Do not come and abuse me o. I only seize the opportunity to say my mind ni o. White women still fall for this???? He’s not interested in money that you don’t have. He’s interested in the green card (or is it blue card?)!!! The fact that you’re 72 is a big advantage to him. It’s just a matter of time. Either you die (because of old age) or he divorces you or he marries a young nigerian girl chosen by his parents and keeps a family here in Nigeria. The desperation of some guys and their family are REAL. That’s how one i know dumped his girlfriend for a woman old enough to be his mother because she’s a citizen abroad and left the very good job he had because he thought he would travel immediately. His shameless sisters were praising him and their new wife up and down (if the woman was naija-based, dem for say she use jazz for am). Till today, no visa. Dude just dey one place. CJ, nothing do you. We’re learning from our Naija babes. Lol, the list is endless. If it’s true love, can’t the woman move to Nigeria ? Must he move to be with her ? dis home office sef! standing in the way of true love. ‘ar go die oh!’ Una call Papa Ajasco! The moment he lands the UK that’s when she will realise love is blind and wicked. Oga go change ways and take off. LEAVE THEM ALONE… THEY BOTH KNOW WHAT THEY ARE GETTING IN TO .. WOULD YOU COMMENT IF A BLACK BRITISH WHO IS 72 FELL IN LOVE WITH A BLACK NIGERIAN BOY OF 27?